Words from the end of our Old Testament reading tonight: ‘and the land had rest from war’ (Joshua 14. 15). They refer to the period after Joshua has entered the land promised to the descendants of Jacob, and has conquered cities like Jericho, Ai, Lachish and Hebron. The Book of Joshua cannot be claimed to be an exhaustive history of the occupation of the land. It is more like a theological interpretation of the foundational story of what later became Israel. The peoples who lived there before the conquest were not utterly driven out, and for centuries the Israelites shared the land with people who worshipped other gods. Nevertheless, the Book of Joshua is keen to tell us that the occupation of these key cities was an act of God, and there are some pretty bloodthirsty scenes. Those words I quoted are perhaps the saddest of all. The land has not had rest from war. It has been marched through and fought over again and again in the three millennia since Joshua. Every empire of the ancient world has had a go at the little strip of land between the sea and the Jordan river, yet somehow God’s ancient people the Jews have survived. Today every Jew has the right to come to the land and dwell in it. It is all too easy then to continue the theologising of Joshua and declare that the right to live in Israel is God given, and therefore anyone or anything which gets in the way is against God and must be opposed. Reading between the lines in Joshua, and the books of Judges, Kings and Samuel, you can see that the situation was much more complex than the theology would allow, and it remains so today. Christians who believe in the God-given right of Jews to inhabit their land also have to take into account the Christians who have lived there for two millennia. Christian churches and communities were uprooted in 1948 when the State of Israel was founded. Muslims, describing themselves also as children of Abraham, have lived in the land for a millennium and a half. 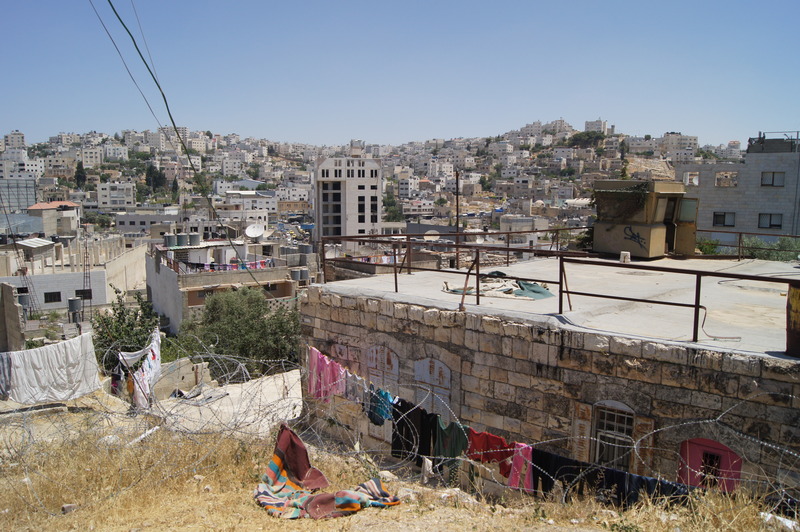 Much of that complexity can still be seen in the city of Hebron, the subject of tonight’s Old Testament reading. It is a key city for Jew, Christian and Muslim. For the Jew it was an early conquest as the land was settled, it commanded the hill country and the desert south of Jerusalem and it was where David first established his Kingdom. For Muslim, Christian and Jew it is the place where Abraham, Isaac, Jacob, Sarah, Rebecca and Leah are buried, in the Cave of Machpelah. Today a small Jewish community is settled, protected by the Israeli Army, in the middle of an Arab city of a quarter of a million or more. The cave in which the Patriarchs and Matriarchs are buried is now topped by a mosque which was a church, with a synagogue in part of the complex. It has been the scene of protests and massacres, and it one of the key flashpoints, being the largest city in the West Bank, yet a focus of Jewish identity. It is hard to see what should happen next, and I will not try. I simply reflect that the Christ of the Beatitudes would seek to find another way to tear down the walls which divide people, and that the key battle now is for the hearts and minds of people at enmity with each other, to find the true way of peace. I found such people in Hebron in June. Women whose embroidery collective brings a living, and whose welcome, as Muslims, to Christians like us was a humbling exercise in hospitality. International Observers, under the auspices of the World Council of Churches, who simply monitored incidents in different flashpoints, and faithfully sought to tell the world this story. And, later, Jews keen to ensure that there was justice for all as well as security for their land. Some Old Testament scholars describe the conquest of the Promised Land as more like a peaceful revolution than an armed invasion. Perhaps the people of Hebron recognised the God of Jacob as the one they wanted to follow. As you pray for that land, remember the people of Hebron, locked in an ancient conflict, and pray for a peaceful transition to the kind of living together which honours their shared heritage as children of Abraham. And echoing the prayers and actions of the Christian minority in Israel and Palestine, pray that the Prince of Peace will rule, and bring peace, so that the land may have ‘rest from war’. Hebron’s disputed centre. Israeli military post on a Palestinian house. You are currently reading Dividing up the land at Jeremy Fletcher's Blog.